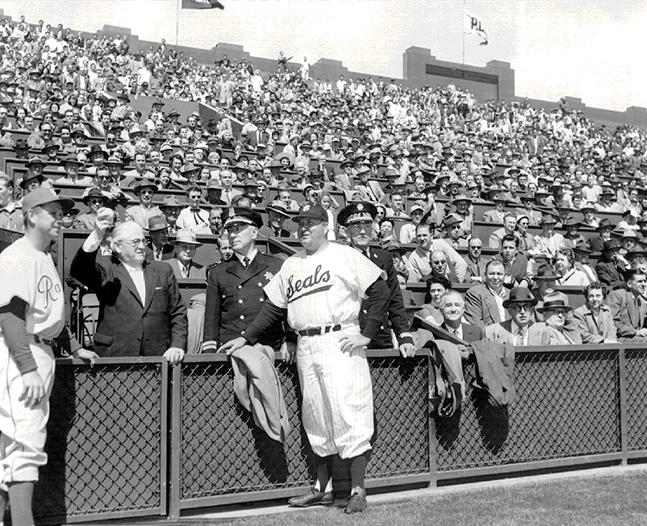 One of San Francisco's most famous and enduring baseball legends was Francis "Lefty" O'Doul. His name graces the [[3rd St Bridge 1990s |3rd Street Drawbridge]] which crosses Mission Creek next to the site proposed for the new Giants ballpark. His restaurant is still open on Geary Street near Union Square. O'Doul was born in 1897 in old [[Hunters Point Mid-1990s | Butchertown]] on the edge of the Islais Creek marshes. He starred for the San Francisco Seals in their heyday, and went on to a respectable 11-year major league career for the Phillies, Dodgers, Yankees and Giants, posting a lifetime batting average of .349, fourth best in history (his fielding was always suspect). 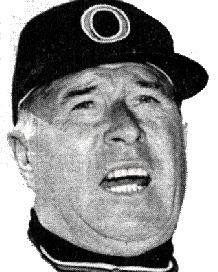 After his playing days were over, he managed the SF Seals in the '40s and '50s, dominating San Francisco baseball like no one else ever has. As a San Francisco native, O'Doul had a nonconformist streak which led him to always dress in all green: green suits, ties, socks, even a green Cadillac. O'Doul was born in 1897 in old [[Hunters Point Mid-1990s | Butchertown]] on the edge of the Islais Creek marshes. He starred for the San Francisco Seals in their heyday, and went on to a respectable 11-year major league career for the Phillies, Dodgers, Yankees and Giants, posting a lifetime batting average of .349, fourth best in history (his fielding was always suspect). After his playing days were over, he managed the SF Seals in the '40s and '50s, dominating San Francisco baseball like no one else ever has. O'Doul gained fame as an ambassador of baseball, helping to spread its popularity in [[Masanori Murakami--First Japanese Player for SF Giants|Japan]] before and after WWII. He died in 1969 and his tombstone says: "He was here at a good time and he had a good time when he was here."